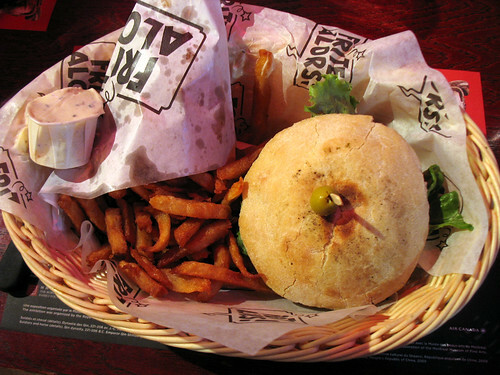 Yum Veggie Burger: Frite Alors! 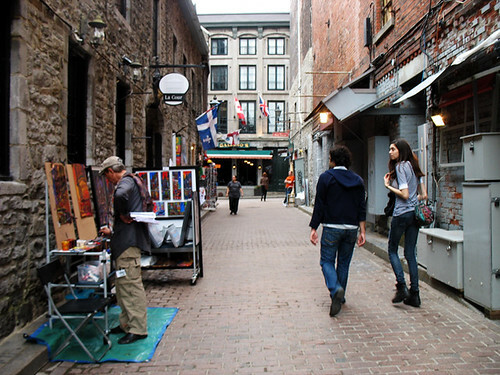 The final chapter of our NY/Canada roadtrip... Montreal! So I ordered a veggie burger with a side of frites (included). 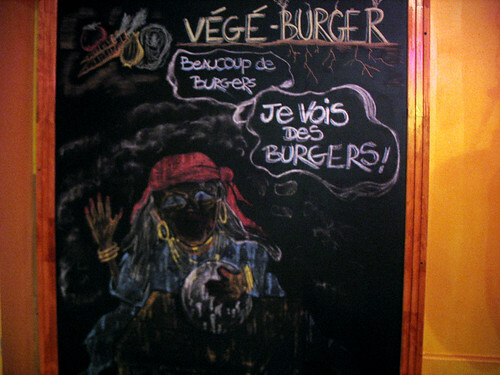 I didn't trust my half-forgotten high French enough to attempt asking whether the burger was vegan or not - sorry, vegan friends! It comes with mayo, but I don't know the status of the patty itself or the bun it's served on. If any Canadian vegans are reading this, maybe you can enlighten us? I chose the "limette" dipping sauce for my frites - mayo with lemon and black pepper. Wow, was that delicious! I've never had that flavor in the states, but I definitely need to attempt to replicate it now because my mouth is watering just thinking about it. The burger came topped with mayo, a generous portion of savory carmelized onions, and lettuce. Maybe I was just really hungry (we all were, by that time) since those toppings sound simplistic writing them out now, but the onions really made the whole burger wonderful. 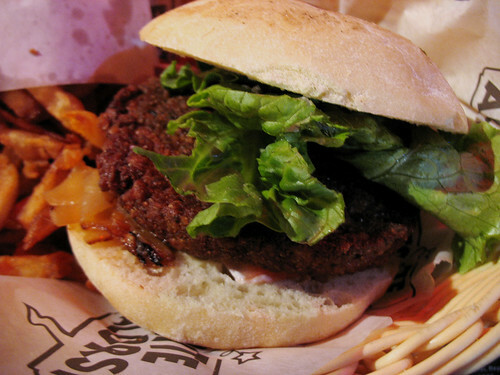 The patty was rather "earthy" again, like the amazing one I'd had at Lick's (is that just a Canadian thing? Must return to gather more evidence...) This one was closer too the pre-made patties I am more familiar with, although it was still pretty darn good. A hearty texture, with grains and probably soy too. 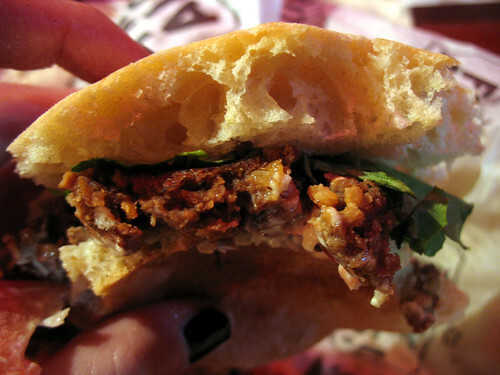 The bun was very tasty, but a little oversized for the patty and toppings - it made the whole thing a little too dry. Still, I was famished, and it was a tasty burger. So overall I was quite happy with my second Canadian veggie burger. 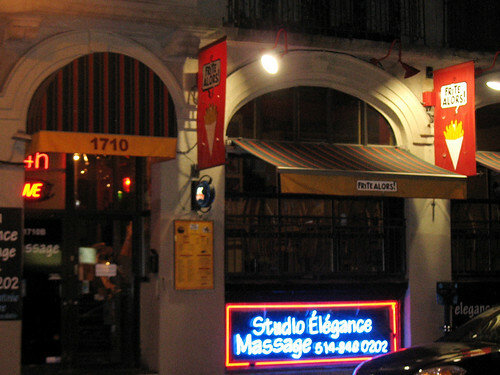 Fueled by food and frites, we headed out to walk around some more and check out Montreal's bar scene. Lots of fun. The next morning we explored more of the city on the awesome public rental bikes again (I think those things are the most brilliant idea EVER! ), and ate more delicious food (I think I filled my quota of pastries for the rest of 2011), but no more veggie burgers, haha. Three in three days is a bit much even for me! Vegan in French is vegetalien! My friend and I were going to try to use it when we were in France but figuered it'd be so out place, they'd just think we were mispronouncing "vegetarien"
Anyway, the burger looks pretty good but I love the looks of those fries! Those frites look amazing! Did the burger have any legumes in it? In any case it looks good.